What does the digital revolution mean for democracy? Is it changing European discourse, or reinforcing existing trends? How does disinformation operate, does it work, and how can it be addressed? Eurozine, the network of European cultural journals, together with the Estonian journal Vikerkaar, the Institute of Social Studies at the University of Tartu, and the Estonian cultural organisation SA Kultuurileht, jointly held the 28th European Meeting of Cultural Journals in Tartu, Estonia, on 20-22 October 2017. Over the course of three days, 100 cultural journalists and media professionals participated in a programme of public talks and discussions on the effects of technology on democracy, and its contribution to phenomena like 'post-truth' and fake news. Leading internet analyst Vladan Joler, Director of Share Foundation, Serbia, in his keynote speech on 20 October, offered insights into the algorithmic 'black boxes' which mediate our experience of the internet, social media and the world, showing how they can be used by political actors and are governed by commercial interests. Showcasing his team's forensic investigations, he warned that these processes are likely to become even less transparent. "These big algorithmic machines are the editors of the 21st century, not humans anymore," he told the audience - many of them editors. Estonia's Minister of Culture Mr. Indrek Saar opened the conference and emphasized the importance of Estonia's vibrant cultural journals. Over the weekend, participants joined panel discussions that featured experts from across Europe and from the US, as well as practical workshops on social media and cross-media publishing. The final day of the conference ended with a participative Barcamp-style format for knowledge sharing. The digital revolution has had a devastating effect on the economics of journalism, and poses unexpected challenges to democracy itself. But it also offers new opportunities for citizens to participate more actively in their societies, and for media outlets - including journals like those in the Eurozine network - to collaborate. How do we address these paradoxes? And what is the role of cultural journals in this process? Eurozine's conference explored these questions, and more, from a range of theoretical and practical perspectives. 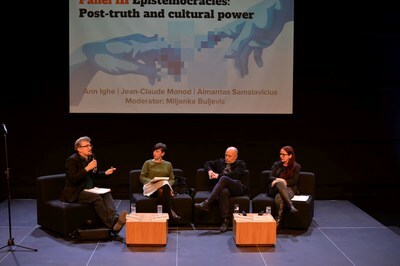 The event was co-sponsored by the European Union (Creative Europe), Eesti Kultuurkapital, the National Endowment for Democracy, the City of Tartu and the Open Society Initiative for Europe.